Expand search to view more listings in and around St Paul. 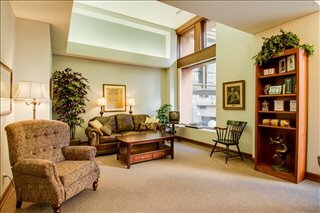 See more offices in and around St Paul. Find your ideal office space in St Paul with our powerful service. Our in-depth knowledge enables us to find the property you require from a wide range of prime locations and office options. Many of our offices offer easy, short term and flexible rental agreements, meaning that you can gain the benefits of a wide range of facilities and a prestigious business address in St Paul, with an agreement that is tailored to your business' needs. Saint Paul is Minnesota's capital city and is known by an unusual pair of nicknames: "The Saintly City" and "Pig's Eye". The city is headquarters to several large-scale companies and corporations, and its main industries are medical device manufacturing, retail, and transportation. Saint Paul is an appealing choice of location for new branch offices and companies looking to relocate. Our goal at Offices.net is to help your company find the ideal work environment, arrange a rental agreement that suits you, and get you into your new workspace as quickly and easily as possible. There are a range of office types available, from conventional space to serviced offices to single hot desks to fixed desks and office suites for teams and the largest organizations. We will be happy to help you navigate the options and find the office that is best for you. Most of the business centers come inclusive of an outstanding array of office services, with friendly reception staff, security and onsite IT personnel, WiFi and internet services. Many of the office buildings also provide video conferencing facilities, conference rooms, and kitchens. Just choose any of the St Paul offices for rent listed above. All of the office space and executive office suites are available on temporary rental terms to suit your requirements and are located in prime St Paul business positions. Offices.net also contains a wide selection of professional office space in other prime Minnesota locations, available on flexible terms. Call us today, and we will be be happy to help you find your exact office space.